A tiny, mysterious moon orbiting Neptune has been spotted for the first time in more than 20 years. 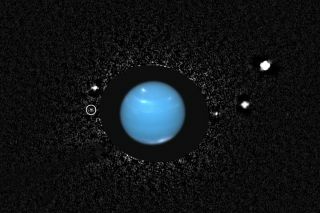 By analyzing photos taken by the Hubble Space Telescope, scientists at the SETI Institute in Mountain View, Calif., have caught sight of Naiad, the innermost of Neptune's moons. The 62-mile-wide (100 kilometers) moon has remained unseen since the cameras on NASA's Voyager 2 spacecraft discovered it in 1989. "Naiad has been an elusive target ever since Voyager left the Neptune system," SETI scientist Mark Showalter said in a statement. Showalter announced the new findings today (Oct. 8) during a session at the annual meeting of the American Astronomical Society's Division for Planetary Sciences, held in Denver. This version of the image identifies all of the bodies orbiting Neptune visible in the image. Note that even the newly-discovered moon, provisionally identified as S/2004 N 1, is visible here as a faint dot. Image released Oct. 8, 2013. Now that scientists have spotted the small moon again, there are other mysteries to be solved. Naiad seems to have drifted off course: The new observations show that the moon is now ahead of its predicted path in orbit around Neptune, SETI officials said. Scientists expect that the new trajectory could have something to do with Naiad's interaction with one of Neptune's other moons that caused the innermost moon to speed up in its orbit. The exact cause of the moon's new orbit won't be known until researchers collect more data. Neptune's slender rings are seen with remarkable clarity in this composite image taken by the Hubble Space Telescope. Image released Oct. 8, 2013. The images taken in 2004 also reveal something about the ring arcs surrounding Neptune. Voyager observed four arcs during its flyby of the system, but the newly processed images show that the two leading arcs are absent, while the two trailing arcs haven't changed, SETI officials said. Scientists aren't sure what is causing this change, but the arcs have been shifting since their discovery. The images were obtained by the High Resolution Channel of the Advanced Camera for Surveys on the telescope. An occulting mask was placed in front of Neptune to reduce the planet's glare. In the image, a color composite of Neptune, taken one month earlier, has been inserted for context. Image released Oct. 8, 2013. "It is always exciting to find new results in old data," Showalter said. "We keep discovering new ways to push the limit of what information can be gleaned from Hubble's vast collection of planetary images." The same images taken by Hubble also helped Showalter and his colleagues find another small moon orbiting Neptune — a discovery they announced in July. The newfound moon, called S/2004 N 1, is much smaller than Naiad, at 12 miles (20 km) across, but it was easier to spot in the images because its orbit takes it farther from Neptune than Naiad's orbit takes it from the planet, SETI officials said. S/2004 N 1 evaded Voyager 2's cameras in 1989 because of its tiny size. During its flyby, Voyager revealed six previously unknown moons circling Neptune. Scientists have now discovered 14 moons in orbit around the blue planet.